Do not miss your opportunity to view this eye catching modern Home Inspired by Frank Lloyd Wright and E Fay Jones. Quality Built in 2007 of CBS construction this amazing home has 7555 total Sq Ft and 5710 A/C Sq Ft. The two story spacious floorplan boasts 5 bedrooms, 5 1/2 Baths, and 3 Car Garage. 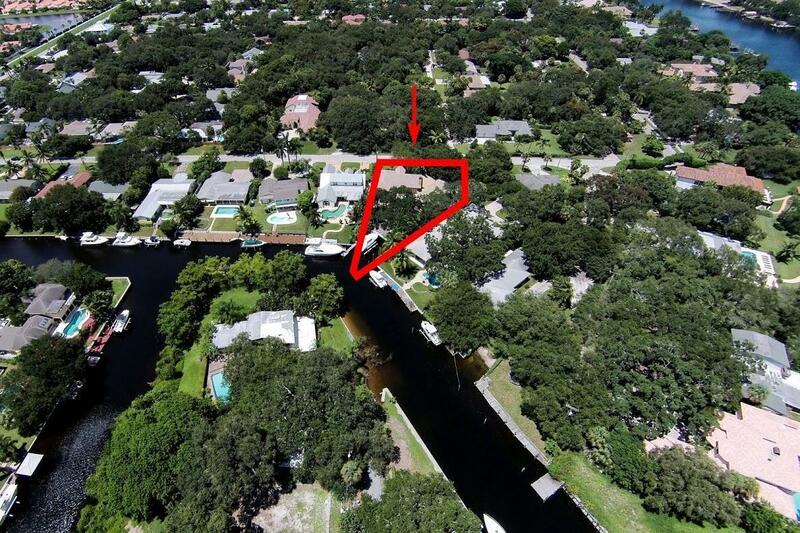 Perfectly situated on .49 acres with northern front exposure the lot has 50 Feet of water frontage. 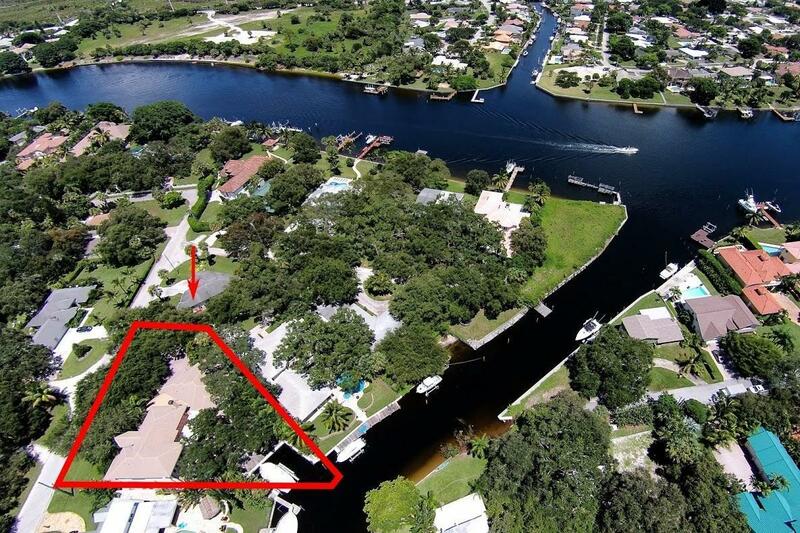 Some of the highlights include private dock with 2 Spaces. 20,000 lb Boat Lift, no fixed bridge, concrete tile roof, 4 zoned a/c's, Clerestory windows, whole house 45,000 watt propane generator, in ground 1000 gallon propane tank, impact windows and doors, cellular controlled security system and Smart House Audio Video, central vac system, sleek modern fixtures throughout.Custom 3 Sided gas fireplace, Saturnia Marble and Brazilian Cherry wood floors, recessed lighting, Shoji Doors, floating staircase, volume ceilings, and crown molding. This home is located on a quiet street in a non-HOA neighborhood. 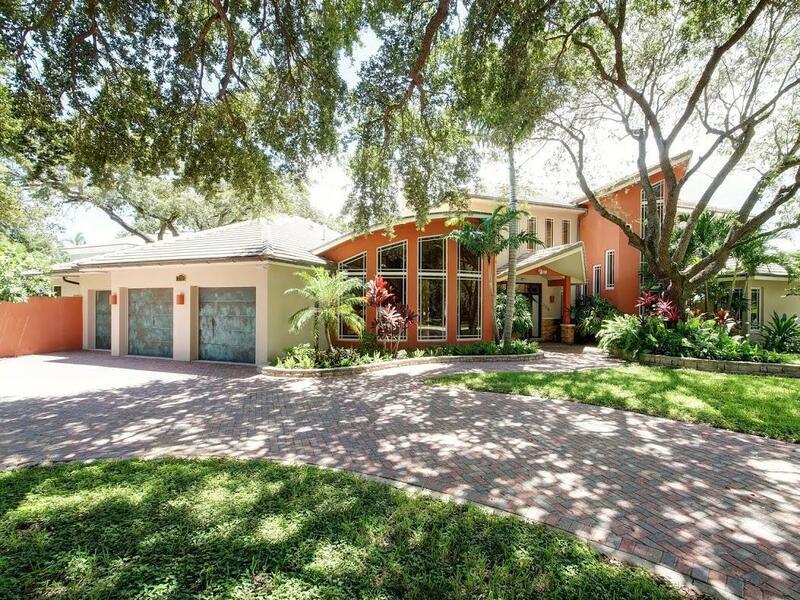 There is a circular paver drive and 3 car garage with custom copper doors. A winding walkway leads to the covered front entry. As you enter the home your eye is drawn to the beautiful backyard views. The formal living room has Saturnia marble floor, volume ceiling, custom 3 sided fireplace, and access to the covered lanai. The Clerestory windows above the door bring in an abundance of sunlight. There are modern wall sconces and a modern ceiling fan. To the left of the living room is the inviting formal dining room. This room has a custom Autumn Ledgestone accent wall, Saturnia Marble floor, modern wall sconces, beautiful chandelier, a wall of windows overlooking the front yard, and a vaulted ceiling. The chefs kitchen is perfect for entertaining with stainless steel top of line kitchen appliances, wood cabinetry with glass front display doors, granite countertops, gas stove with stainless hood, island with vegetable sink, Saturnia Marble floors, recessed lighting, and breakfast bar. The wet bar has a beverage cooler and additional storage. It's open to the family room with Saturnia marble floors, access to the covered lanai, ceiling fan, recessed lighting, and media center built-ins with lighting. There are 2 bedroom suites on this side of the home along with a large laundry room. Each guest suite has Brazilian cherry floors, walk in closet, and attached full bath. The generously sized laundry has utility sink, storage cabinetry, a built in safe, and Maytag Bravos Steam Dryer and Top Load Washer. To the right of the formal living room is the home office/den (currently used as a guest suite) with Brazilian Cherry wood floors, coffered ceiling with lighting, windows overlooking the backyard, and attached bath. The first floor master suite has carpeted floor, tray ceiling with lighting, ceiling fan, access to the covered lanai, and custom closet with built ins. The luxurious attached bath has jetted tub, separate water closet, and wood cabinetry. Next to the master suite is another full guest suite with carpeted floor, Soji doors, walkthrough closet, and attached full bath. The floating staircase takes you to the loft that overlooks the formal living room. The loft has Brazilian cherry floor, ceiling fans, access to the balcony, and steel and wood railings. The second floor master suite has carpeted floor, tray ceiling with accent lighting, doors to the balcony, 2 walk in closets with built ins, and attached luxury bath with walk thru shower, jetted tub, and custom tile work. The covered lanai has tongue and groove cypress ceiling and a summer kitchen. Above is the balcony with Coquina flooring and steel railings. Outdoor living is easy with inground pool with raised spa, paver patio, mature landscaping with landscape lighting, and a 100 year old oak tree and with rustic seating area built from limbs of the same tree! 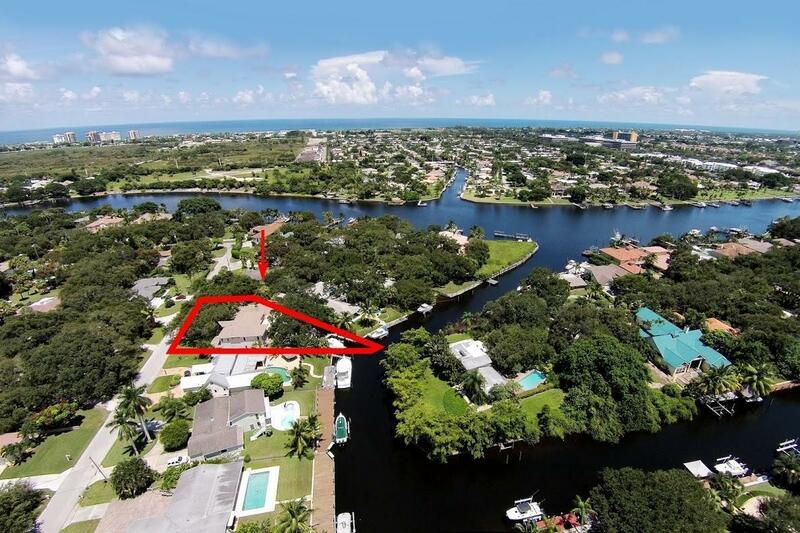 The property is located near world class dining and entertainment venues, beautiful beaches of Jupiter and Juno, and a short distance to PBIA and I-95.